Okayama University researchers describe in the journal Optics Express the use of Terahertz (THz) chemical microscopy to measure the pH of water-based solutions with a volume as small as 16 nL. The findings are important to be able to measure pH concentrations in small-volume solutions for clinical and environmental analyses. For clinical and environmental research and monitoring it is important to be able to measure pH concentrations in small-volume solutions. However, conventional systems used to measure the concentration of ions require the use of reference electrodes that end up reducing the volume of the solution, setting a limit on the minimum volume that it is possible to analyze. 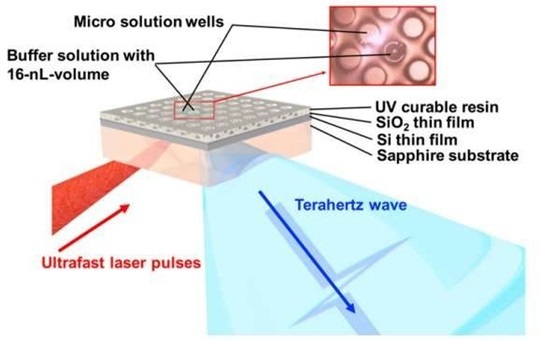 Now, Dr.Toshihiko Kiwa and colleagues at the Graduate School of Natural Science and Technology in Okayama University, Japan, demonstrated the use of Terahertz (THz) chemical microscopy to measure the pH of water-based solutions with a volume as small as 16 nL. The results are published in Optics Express. This type of microscope has a sensing plate with patterned micro wells hosting the solution; an ultrafast laser pulse directed on the sensing plate generates a photocurrent with ultrafast modulation that, in turn, emits THz radiation into free space. Because the amplitude of the THz radiation depends on the concentration of ions in the micro wells, this method opens up the possibility of imaging the concentration of ions without the need of using electrodes. This enables the measurement of volumes of solution that would be too small for conventional methods. The THz chemical microscope, which was developed by this same group in 2007, features a semiconducting (silicon) thin film mounted on a sapphire substrate that acts as the sensing plate. A layer of oxide naturally forms on the silicon film, providing an insulating layer between the silicon surface and the solution. The researchers added a resin on top of the oxide layer and used conventional photolithographic techniques to pattern micro wells in it, obtaining wells with a volume of 16 nL. They also optimized the laser pulses to stabilize the signal, and integrating this method into the microscope is part of the next steps the researchers intend to take. Thinking about the future directions the team is interested to explore, the author say that "we will attempt the integration for multi-ion sensing and reducing the laser spot size to improve the accuracy of THz chemical microscopy."